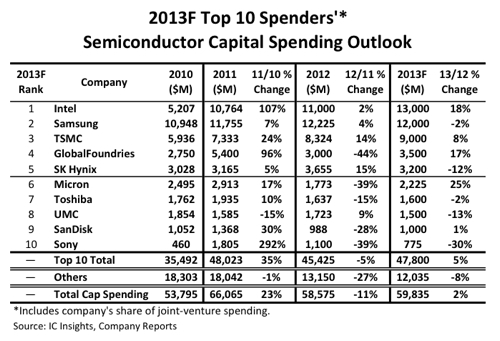 IC Insights has provided the top-10 spenders of semiconductor equipment in 2013 as listed in Figure 1 below. As shown, there are five companies that are expected to spend at least $3.0 billion in 2013, the same as in 2012 and 2011. Figure 1 also shows that although the top-10 capital spenders cut their outlays by 5% in 2012, the non-top-10 spenders cut their capital spending by 27% last year, illustrating how “top-heavy” the semiconductor capital spending environment has become. For 2013, the top-10 capital spenders are forecast to increase their spending by 5% as compared to 2012, which would be 13 points better than the results expected from the non-top-10 companies (-8%). IC Insights believes that, in the long run, the “other” companies are likely to continue to increase their spending at a slower rate, or decrease their spending at a higher rate, as compared to the top 10 companies as they implement the fabless or “fab-lite” business models for their IC production. In IC Insights’ opinion, IC manufacturers that are currently spending less than $1.0 billion a year on capital outlays will find it just about impossible to manufacture using leading-edge digital processing technology. Companies that are in significant trouble in this regard include Taiwanese IC suppliers Nanya, Powerchip, and ProMOS. These three companies combined spent only $276 million in 2012, which is less than 10% of the cost of one new leading-edge IC fab. Some of the most “eye-catching” numbers with regards to the capital spending outlays are the massive amounts of spending expected by Samsung and Intel over the 2010-2013 time period. Over this four-year period, Samsung is forecast to spend $46.9 billion, with about 60% of this amount targeting memory production. Intel is forecast to be second to Samsung in total outlays over this time period with an expected $40.0 billion in capital expenditures. These huge levels of spending are enough for each company to construct and equip ten or eleven $4.0 billion leading-edge 300mm wafer fabs. Notably, the combined spending by Samsung and Intel represented 40% of the world’s semiconductor capital outlays in 2012, with this percentage expected to rise to 42% of total capital spending in 2013. Figure 2 segments the forecasted 2013 capital spending by company headquarters location with results from eight years earlier in 2005 also shown. 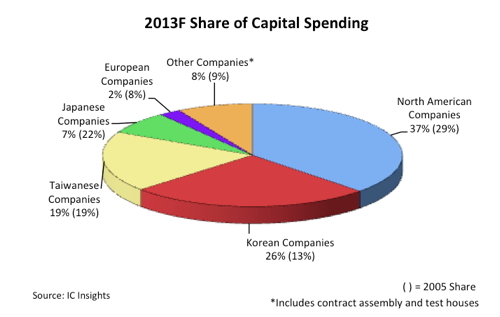 In 2013, only the North American suppliers, which are expected to represent 37% of worldwide spending (up eight points from eight years earlier), and the South Korean semiconductor companies, which are forecast to represent 26% of capital outlays (up 13 points in share from 2005), are expected to hold a larger share of spending in 2013 than they did in 2005. Since adopting the fab-lite business model, the three major European IC producers are now forecast to represent only about 2% of the spending total in 2013 after representing 8% of worldwide semiconductor capital spending in 2005. In comparing the forecast for 2013 with the actual results in 2005, declines in capital spending marketshare are expected by the Japanese (15 points), European (six points), and “other” companies (one point). The sharp loss of share by the Japanese and European companies is primarily due to the movement of many of these producers to the fab-lite manufacturing model. The Taiwanese companies’ flat share is due to a mixture of the second-tier Taiwanese DRAM producers Nanya, Powerchip, and ProMOS keeping their capital expenditures to the bare minimum this year while the Taiwanese foundries TSMC and UMC strive to be aggressive. The “other” segment includes companies from India, Singapore, China, etc., as well as the major contract assembly and test houses (i.e., OSAT suppliers). Although there have been periodic spikes in the “other” spending over the years, IC Insights believes that in the long-term, the “other” category will represent a flat to slowly shrinking share of total semiconductor industry capital spending. The data in this research bulletin was excerpted from IC Insights’ soon-to-be-released March Update to the 2013 edition of IC Insights’ flagship report, The McClean Report—A Complete Analysis and Forecast of the Integrated Circuit Industry, which features more than 400 tables and graphs in the main report alone. A subscription to The McClean Report includes free monthly updates from March through November (including a 250+ page Mid-Year Report), and free access to subscriber-only webinars throughout the year. An individual-user subscription to the 2013 edition of The McClean Report is priced at $3,390 and includes an Internet access password. A multi-user worldwide corporate license is available for $6,390.